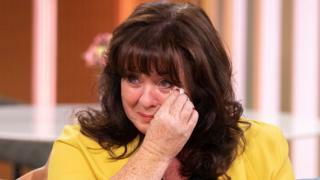 Coleen Nolan has pulled out of Thursday's Loose Women panel following an on-screen spat with Kim Woodburn. A message posted on her official Twitter account said the presenter was still "very upset" about last week's incident. Woodburn had been invited on to the programme to reconcile with Nolan after they fell out on a previous series of Celebrity Big Brother. But Woodburn became tearful and stormed off set after clashing with the panel. Ofcom received more than 7,000 complaints about the episode, with viewers accusing Nolan and other panellists of bullying Woodburn. On Tuesday's This Morning, Nolan explained: ""If I could go back in time I would change the whole thing, it was never meant to be like that." "I honestly, genuinely thought that [Kim] was coming on to make amends,"
"I have to say it was so shocking, genuinely shocking for all of us. I don't like to see anybody in that much distress, how she was in the end. It's been the worst week of my life actually." The singer and presenter became emotional as Holly Willoughby comforted her. "I'm so sorry," Nolan added, "I don't know what I did wrong, I didn't say anything,"
"I said about two things in that interview because I know what she's like and I thought she needs help really and I feel terribly sorry for her." Nolan also explained that there's a campaign to get her fired from the show and that she's been sent "revolting" messages. The tweet follows Nolan's announcement of her first solo tour which starts in January, which will see her stepping down from the Loose Women panel until February. Celebrity Big Brother 2018: Who's in the house?